I could eventually figure this out, but I am new to TiKz, and would help to know if someone already has the code. Take a look at the PGFmanual, especially the tape shape from the shapes.symbols library and the trapezium shape from the shapes.geometric library. 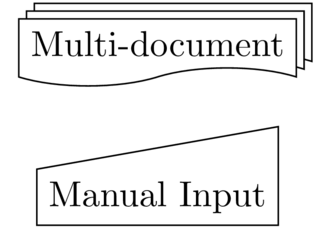 For the multi-document node the double copy shadow shadow is used with the fill=white option. The double copy shadow key is also explained in the manual and accepts any additional shadow options. Not the answer you're looking for? Browse other questions tagged tikz-pgf diagrams nodes or ask your own question. How to draw an overlaid pages image for a Tikz flowchart node? How do I draw shapes inside a tikz node? How to draw a diagram of Long Short-Term Memory?